INTRODUCTION: AKT protein family, which members are also called protein kinases B (PKB) plays an important role in mammalian cellular signaling. The serine/threonine kinase Akt, or protein kinase B, has recently been a focus of interest because of its activity to inhibit apoptosis. It mediates cell survival by acting as a transducer of signals from growth factor receptors that activate phosphatidylinositol 3-kinase. Akt1 is involved in cellular survival pathways, by inhibiting apoptotic processes. Akt1 is also able to induce protein synthesis pathways, and is therefore a key signaling protein in the cellular pathways that lead to skeletal muscle hypertrophy, and general tissue growth. Since it can block apoptosis, and thereby promote cell survival, Akt1 has been implicated as a major factor in many types of cancer. Akt (now also called Akt1) was originally identified as the oncogene in the transforming retrovirus, AKT8 1. AKT8 was isolated from an AKR mouse spontaneous thymoma cell line by cocultivation with an indicator mink cell line. The transforming cellular sequences, v-akt, were cloned from a transformed mink cell clone and these sequences were used to identify Akt1 and Akt2 in a human clone library. AKT8 was isolated by Stephen Staal in the laboratory of Wallace P. Rowe; he subsequently cloned v-akt and human AKT1 and AKT2 while on staff at the Johns Hopkins Oncology Center 2. Akt2 is an important signaling molecule in the Insulin signaling pathway. It is required to induce glucose transport. These separate roles for Akt1 and Akt2 were demonstrated by studying mice in which either the Akt1 or the Akt2 gene was deleted, or "knocked out". In a mouse which is null for Akt1 but normal for Akt2, glucose homeostasis is unperturbed, but the animals are smaller, consistent with a role for Akt1 in growth. In contrast, mice which do not have Akt2, but have normal Akt1, have mild growth deficiency and display a diabetic phenotype (insulin resistance), again consistent with the idea that Akt2 is more specific for the insulin receptor signaling pathway 3. The role of Akt3 is less clear, though it appears to be predominantly expressed in brain. It has been reported that mice lacking Akt3 have small brains 4. The name Akt does not refer to its function. Presumably, the "Ak" in Akt was a temporary classification name for a mouse strain developing spontaneous thymic lymphomas. The "t" stands for ‘transforming’; the letter was added when a transforming retrovirus was isolated from the Ak strain, which was termed "Akt-8". When the oncogene encoded in this virus was discovered, it was termed v-Akt. Thus, the later identified human analogues were named accordingly. Signal Transduction Mediated by the PI3K/Akt Pathway: The lipid kinase PI3K (Phosphoinositide 3- kinase) is involved in the regulation of a number of cellular processes, like transcription, migration, angiogenesis, cell growth, proliferation, apoptosis and glucose metabolism. PI3K is activated by several hormones including insulin, growth factors such as EGF, IGF(Insulin like growth factor), PDGF, NGF, HGF, by signals derived from receptors for extracellular matrix molecules such as integrins, by several forms of cellular stress such as oxidative stress or cell swelling, PI3K phosphorylates phosphatidylinositols of the cell membrane, thus generating, e.g., phosphatidylinositol- 3, 4, 5- trisphosphate (PIP3) from phosphatidylinositol-4,5-bisphosphate (PIP2). PIP3 at the cell membrane recruits protein kinases such as PKB/Akt and PDK1 which bind with their PH-(pleckstrin homology)-domain to PIP3. Full activation of PKB/Akt requires the phosphorylation by the Ser473-Kinase (PDK2: integrin-linked kinase-1: (ILK-1) or DNA-dependent protein kinase (DNA-PK)) and by PDK1 at Thr-308. PDK1 further activates SGK and and aPKC. PKB/Akt, aPKC and SGK in turn phosphorylate a wide variety of cellular signaling molecules relevant for the regulation of cell growth, cell cycle and cell proliferation, including FKHR, GSK3ß, mTOR and p70S6K, for apoptosis, including Bad, caspase 9, IκB, FKHR, Mdm2, or for transport, including several transporters and channels (Fig. 1). PKB/Akt further activates mTOR, a kinase stimulating the uptake of nutrients such as glucose, amino acids, cholesterol and iron. mTOR regulates the phosphorylation of p70S6K which can similarly be activated by PDK1. mTOR further activates eIF4E-binding protein-1 and thus is involved in the regulation of translation. 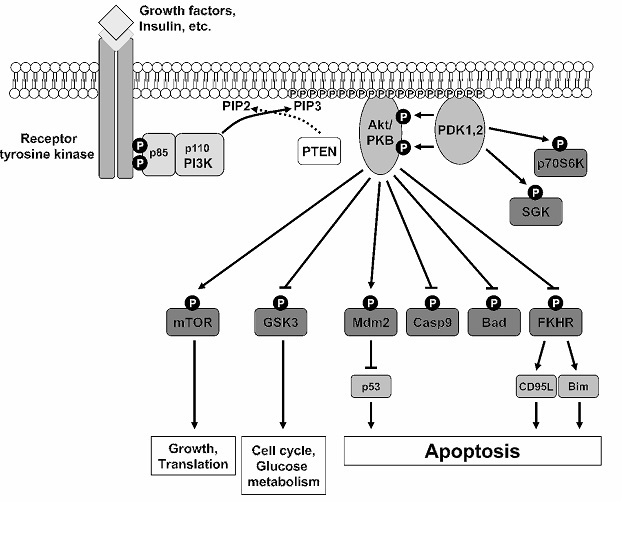 Activation: Akt is activated as a result of inactivation of tumor suppressor PTEN (Phosphatase and tensing homolog), a lipid phosphatase mutated or deleted in >50% of human cancers .Both Akt1 and Akt2 are commonly overexpressed or constitutively active in a large number of human cancers including brain, gastric, colon, breast, lung, and prostate carcinomas and their activation correlates to cancer progression. Activation of Akt is a multi-step process involving both membrane binding and phosphorylation. Upon PI3K activation and production of PtdIns-3,4,5-P3 and PtdIns-3,4-P2, Akt is recruited to the plasma membrane where it binds to the these phosphoinositides through its PH domain 5. Activation is then thought to involve a conformational change and phosphorylation on two residues. One such phosphorylation site lies within the kinase domain activation loop (Thr 308 in Akt1) and is phosphorylated by another PH-domain containing protein, PDK1. In addition, a second phosphorylation site in the C-terminus (Ser 473 in Akt1) is required for full or maximal activity. Growth factor stimulation of PI3K activity leads to Akt activation. Conversely, PI3K inhibition (i.e. using chemical inhibitors such as wortmannin or LY294002) and PTEN mediated dephosphorylation of PtdIns-3, 4, 5-P3 and PtdIns-3,4-P2 results in inhibition of Akt. After activation, Akt can phosphorylate a number of substrates both in the cytoplasm and in the nucleus. Binding Phospholipids: Akt possesses a protein domain known as a PH domain, or Pleckstrin Homology domain, named after Pleckstrin, the protein in which it was first discovered. 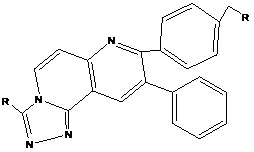 This domain binds to phosphoinositides with high affinity. In the case of the PH domain of Akt, it binds either PIP3 (phosphatidylinositol (3, 4, 5) trisphosphate, PtdIns(3,4,5)P3) or PIP2 (phosphatidylinositol (3,4)-bisphosphate, PtdIns(3,4)P2) .This is useful for control of cellular signaling because the di-phosphorylated phosphoinositide PIP2 is only phosphorylated by the family of enzymes, PI 3-kinases (phosphoinositide 3-kinase or PI3-K), and only upon receipt of chemical messengers which tell the cell to begin the growth process. For example, PI 3-kinases may be activated by a G protein coupled receptor or receptor tyrosine kinase such as the insulin receptor. Once activated, PI 3-kinase phosphorylates PIP2 to form PIP3. Phosphorylation: Akt phosphorylates a variety of substrates involved in the regulation of key cellular functions including cell growth and survival, glucose metabolism and protein translation. These targets include GSK3, IRS-1 (insulin receptor susbtrate-1), PDE-3B (phosphodiesterase-3B), BAD, human caspase 9, Forkhead and NF-kB transcription factors, mTOR, eNOS, Raf protein kinase, BRCA1, and p21. Lipid Phosphatases and PIP3:PI3K dependent Akt activation can be regulated through the tumor suppressor PTEN, which works essentially as the opposite of PI3K mentioned above .PTEN acts as a phosphatase to dephosphorylate PtdIns (3, 4, 5) P3 back to PtdIns (4, 5) P2. This removes the membrane-localization factor from the Akt signaling pathway. Without this localization, the rate of Akt activation decreases significantly, as do the all the downstream pathways that depend on Akt for activation. PIP3 can also be de-phosphorylated at the "5" position by the SHIP family of inositol phosphatases, SHIP1 and SHIP2. These poly-phosphate inositil phosphatases dephosphorylate PtdIns (3, 4, 5) P3 to form PtdIns (3, 4) P2. Protein Phosphatases: The phosphatases in the PHLPP family, PHLPP1 and PHLPP2 have been shown to directly de-phosphorylate, and therefore inactivate, distinct Akt isoforms. PHLPP2 dephosphorylates Akt1 and Akt3, whereas PHLPP1 is specific for Akt 2 and Akt3. Growth signal autonomy process: Akt overexpression or activation may lead to increased response to ambient levels of growth factors. Insensitivity to antiproliferative signals: Akt induces nuclear entry of Mdm2, which leads to inhibition of p53 regulated processes.Induces cytoplasmic localization of p21Cip/Waf1 and p27Kip, promoting proliferation and stabilizes Cyclin D1. Inhibition of apoptosis: Akt inactivates the proapoptotic factors Bad and Procaspase-9. Activates IKK, activating the transcription of NF-jB regulated antiapoptotic genes.Inactivates Forkhead family transcription factors, inhibiting proapoptotic gene expression, such as Fas ligand. Akt inhibitors as Anticancer: These are the novel agents which inhibit proliferation, and reverse the repression of apoptosis and the resistance to cytotoxic therapy in cancer cells. Inhibitors of proteins that are involved in several PI3K/Akt signalling pathways have been under development for some time, and some have now entered clinical trials. These include inhibitors that target both upstream regulators of PI3K/Akt, such as growth factor receptors, and downstream effectors, such as the components of the mTOR pathway. Drug falling these category are summarized in the Table 1. Akt in Ovarian Cancer: A study of 91 ovarian cancer specimens revealed elevated levels of p-Akt 2 (Ser 474) in 33 cases (36.3%). Most tumors displaying activated Akt 2 were high grade and in stages III and IV. p-Akt 2 in tumor specimens localized to the cell membrane and cytoplasm but not the nucleus. Five cases displayed elevated p-Akt 1 (Ser 473) but not p-Akt 2 6. In another investigation of human ovarian cancer, a tumor tissue microarray with a pan–p-Akt (Ser 473) antibody revealed elevated staining in 21 (68%) of 31 ovarian carcinomas. p-Akt staining was associated with activated phospho-mTOR in 27 (87%) of 31 ovarian tumors 7. Akt in Prostatic and Renal Adenocarcinomas: Immuno- histochemical staining of p-Akt (Ser 473) in a study of 74 biopsy specimens of resected prostate cancer was significantly greater in cases with Gleason grades 8 to 10 (92% of such cases staining strongly) compared with prostatic intraepithelial neoplasia (PIN) and all other grades of prostate cancer. Only 10% of the latter cases stained strongly 8. Akt in Gastrointestinal and Pancreaticobiliary Carcinomas: In a study of 65 patients with pancreatic ductal adenocarcinomas, a significant positive correlation between high p-Akt and Akt 2 expression and low 5-year survival rate was observed; suggesting p-Akt was a useful prognostic indicator 9. Recently in 2010, Cadrin et al., investigated that investigated the role of Akt (1 and 2) in regulating IF expression in different epithelial cancer cell lines. Over-expression of Akt1 increases K8/18 proteins. Akt2 up-regulates K18 and vimentin expression by an increased mRNA stability 10. Recently Bourbeau et al., described the series of 2-aminothiadiazole of inhibitors of AKT1. Moderate selectivity observed in several compounds for AKT1 versus PKA is rationalized by X-ray crystallographic analysis. Key compounds showed activity in cellular assays measuring phosphorylation of two AKT substrates, PRAS40 and FKHRL1 11. In 2009, Li et al., synthesis a series of [1, 2, 4] triazolo [3, 4- f] [1, 6] naphthyridine allosteric dual inhibitors of Akt1 and 2 have been developed. These compounds have been shown to have potent dual Akt1 and 2 cell potency 12. In the year 2008, Wu et al., reports a new synthetic route of pyridopyrimidines to facilitate their structural optimization in a library fashion and describes the development of pyridopyrimidines that have excellent enzymatic and cell potency against Akt1 and Akt2 13. Again in 2009, Cho et al.,studied Akt1 silencing efﬁciencies in lung cancer cells by sh/si/ssiRNA transfection using a reductable polyspermine carrier 14. In 2008, Hartnett et al., shows inhibitor SAR on a pyridine series of allosteric Akt inhibitors to optimize enzymatic and cellular and also highlight the pharmacokinetic proﬁle of an optimized inhibitor that has low clearance and long half life in dogs 15. In 2008 Bilodeau et al., synthesis series of naphthyridine and naphthyridinone allosteric dual inhibitors of Akt1 and 2 have been developed. These compounds have been optimized to have potent dual activity against the activated kinase as well as the activation of Akt in cells 16. CONCLUSION: In conclusion, direct genetic alterations leading to deregulated PI3K/Akt signaling are common in a significant fraction of human malignancies. The phosphoinositide 3-kinase (PI3K)/AKT pathway has been shown to be central in the promotion of cell survival since the alteration of this signalling cascade is a frequent event in human malignancies. Cellular processes regulated by AKT include cell proliferation and survival, cell size and response to nutrient availability, intermediary metabolism, angiogenesis, and tissue invasion. All these processes represent hallmarks of cancer. Staal SP, Hartley JW, Rowe WP. Isolation of transforming murine leukemia viruses from mice with a high incidence of spontaneous lymphoma. Proc. Natl. Acad. Sci. U.S.A. 1977; 74 (7): 3065–3067. Staal SP. Molecular cloning of the akt oncogene and its human homologues AKT1 and AKT2: amplification of AKT1 in a primary human gastric adenocarcinoma. Proc. Natl. Acad. Sci. U.S.A. 1987; 84 (14): 5034–5037. Garofalo RS, Orena SJ, Rafidi K, Torchia AJ, Stock JL, Hildebrandt AL, Coskran T, Black SC, Brees DJ, Wicks JR, McNeish JD, Coleman KG. Severe diabetes, age-dependent loss of adipose tissue, and mild growth deficiency in mice lacking Akt2/PKB beta. J. Clin. Invest. 2003; 112 (2): 197–208. Yang ZZ, Tschopp O, Baudry A, Dümmler B, Hynx D, Hemmings BA. Physiological functions of protein kinase B/Akt. Biochem. Soc. Trans. 2004; 32 (Pt 2): 350–354. Franke TF, Kaplan DR, Cantley LC, & Toker A. Direct regulation of the Akt protooncogene product by phosphatidylinositol-3, 4-bisphosphate. Science 1997; 275(5300): 665-668. Altomare DA, Wang HQ, Skele KL, De Rienzo A, Klein-Szanto AJ, Godwin AK, et al. AKT and mTOR phosphorylation is frequently detected in ovarian cancer and can be targeted to disrupt ovarian tumor cell growth. Oncogene 2004; 23(34):5853-5857. Malik SN, BrattainM, Ghosh PM, Troyer DA, Prihoda T, Bedolla R, et al. Immunohistochemical demonstration of phospho-Akt in high Gleason grade prostate cancer. Clin Cancer Res 2002; 8(4):1168-1171. Yamamoto S, Tomita Y, Hoshida Y, Morooka T, Nagano H, Dono K, et al. Prognostic significance of activated Akt expression in pancreatic ductal adenocarcinoma. Clin Cancer Res 2004; 10(8):2846-50. Cadrin et al. Akt isoforms regulate intermediate ﬁlament protein levels in epithelial carcinoma cells. FEBS Letters 2010; 584: 984–988. Bourbeau et al. 2-Aminothiadiazole inhibitors of AKT1 as potential cancer therapeutics. Bioorganic & Medicinal Chemistry Letters 2010; 20: 1652–1656. Li et al. Allosteric inhibitors of Akt1 and Akt2: Discovery of [1,2,4]triazolo[3,4-f][1,6]naphthyridines with potent and balanced activity. Bioorganic & Medicinal Chemistry Letters 2009; 19: 834–836. Wu et al. Development of Pyridopyrimidines as Potent Akt1/2 Inhibitors. Bioorganic & Medicinal Chemistry Letters 2008; 18: 1274–1279. Cho et al. Akt1 silencing efﬁciencies in lung cancer cells by sh/si/ssiRNA transfection using a reductable polyspermine carrier. Biomaterials 2009; 30: 1635–1647. Hartnett et al. Optimization of 2, 3, 5-trisubstituted pyridine derivatives as potent allosteric Akt1 and Akt2 inhibitors. Bioorganic & Medicinal Chemistry Letters 2008; 18: 2194–2197. Bilodeau et al. Allosteric inhibitors of Akt1 and Akt2: A naphthyridinone with eﬃcacy in an A2780 tumor xenograft model. Bioorganic & Medicinal Chemistry Letters 2008; 18: 3178–3182.